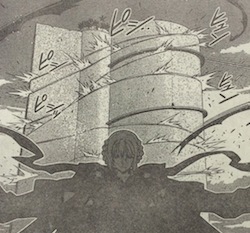 The UQ Holder Chapter 130 goodness begins after an incredibly long wait. Let’s get to the images, which are all low res in nature. Well now, well now. Two things stand out from this. First, Asuna has been brought into the mix somehow. So how does that work exactly so that she’s able to fight alongside Touta? 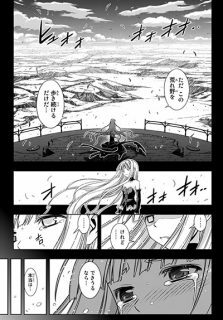 Well, if they are still in the phantasmagoria that the Mage of the Beginning made real with her Lifemaker power, then Asuna would have been there. So that might explain it. The second item I noticed is that Touta’s own harem of Karin, Kuroumaru, Kirie, and I guess Yukihime (not really sure since she doesn’t look big or tall enough, unless it is the Yukihime face in the Eva body) show up. They seem to be generated from the shadow/black substance. That could explain Negi’s companions — creations of the Lifemaker. Update #1: Another images has appeared. I don’t like seeing a sad Eva, but that’s just me. More updates, as they come. Update #2: Not a spoiler, but it is an advertisement for anime. Update #3: Another round of low-res images. Doing some checking, they are coming from MK, so I’m going to send a link that way. At least Akamatsu-Sensei is being true to himself, with all the fanservice. The second item I noticed is that Touta’s own harem of Karin, Kuroumaru, Kirie, and I guess Yukihime (not really sure since she doesn’t look big or tall enough, unless it is the Yukihime face in the Eva body) show up. Yeah, I noticed the hair clip, but I didn’t put two and two together. Ah. Good point. I’d forgotten about that. So this anime is happening, I’d believed to it to be nothing but crude air. I’m still not clear on the details, but maybe someone will come along and clear that up. Who is this weeping woman and what has she done with Evangeline A.K. Mc Dowell? I guess poor Shinobu’s been kicked out of the harem and nobody cared. Ha!ha! Her and Ayaka’s granddaughter. I think its Eva and not Kuromaru – and multiple copies, I see 4 Karins, 2 Kiries, and 2 Evas. Touta only had one day with the female Kuro, and I think too little exposure, while the other three girls, Touta has spent time, and has expressed his feeling towards them. Alberio also likes to make fun of Eva, and could be creating images of Eva to make fun of her or show her in compromising situations like the bunny foot warmers in the earlier chapter. They seem to be generated from the shadow/black substance. That could explain Negi’s companions — creations of the Lifemaker. Even Asuna. She can also be a fantasy creation to confuse/mentally defeat Tota. -or- Asuna is that strong to break into this illusion with her own ability to help Tota, and fight what the MotB is doing, but logically I would think she should be helping Negi and fighting the MotB than helping Tota so something isn’t correct. But how does she know Tota? Yes, many questions!!! Dear God, if you’re bringing Negima characters in, the least you can do is making them the real ones instead of keeping trolling like this. These characters already had too many chances to show themselves at their supposed best and most awesome taken away from them. They didn’t even get to have their final battle with the Lifemaker shown at all. Spending time with characters who aren’t even ‘real’ within the story is such a waste of space and readers’ interest, especially now with a monthly schedule. And if the Lifemaker’s going to such convoluted lenghts I think she should simply get a hint at last and start following the ‘Just Shoot Them Already!’ principle. Time and time again the character’s had every advantage just by losing everything through behaving like an overconfident idiot at the key moment (like doing nothing while 3-A woke Asuna up despite being well enough as to instantly paralyze the whole of Ala Rubra). A villain who is almost all powerful but keeps losing because they’re contractually obliged to act like a moron when the plot calls for it is not a ‘good’ villain at all. 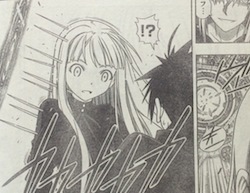 Well, the flashback phantasmagoria stuff was partially a way to get folks who’ve never read Negima up to speed. Also, I thought it was a nice nod to Negima fans. And if the Lifemaker’s going to such convoluted lenghts I think she should simply get a hint at last and start following the ‘Just Shoot Them Already!’ principle. Time and time again the character’s had every advantage just by losing everything through behaving like an overconfident idiot at the key moment (like doing nothing while 3-A woke Asuna up despite being well enough as to instantly paralyze the whole of Ala Rubra). I give MotB a pass on this for one reason — she’s been alive for over a millennia. She cannot be killed. The two most powerful mages in recent history (Nagi and Negi) could not defeat her. From her perspective, there’s no danger of dying. She has no fear of death. So allowing Touta to do whatever is likely a way for her to find some amusement in an otherwise boring and painful existence. Should Touta kill Negi, she simply possesses Touta and it continues. So yeah, a more traditional villain, you are absolutely right. But I don’t see MotB in that vein. Her confidence is backed by century after century after century of proof. Plus, I think in the end, she may want to die, at least at some level. I feel I have to disagree on both points– the phantasmagoria was both too short to really tell us who those characters are and why are they supposed to matter and too standard to count as a good treat for older fans, because there was literally nothing new there. It was just a hurried regurgitation of old routines that tried to be two things at once and failed at being either. I see a new reader, especially one of this specific magazine who’s never read Shonen Magazine or Negima before, just scratching their heads at how do these different sets of characters whose complicated deals are barely explained relate to each other, and what of story is this supposed to be– the mood swings of the narrative are too stark and abrupt. It doesn’t help that more than half of Negima, the part where all the major revelations pertaining UQ Holder happen, was never animated, or was animated just in very brief passing, like the end of the Mundus Magicus saga, making the whole lore required to actually understand what’s going on even more limited for general audiences. I was a Negima fan and these token bait attempts of pandering fanservice just leave me cold, because they are too shallow– Holder has this bad habit, both with new and old characters, to erratically pick and drop characters and plot threads with little apparent rhyme or reason. Things just suddenly happen, they aren’t explained enough, then they are just as quickly shoved aside for the next ‘shocking!’ event, like the whole thing’s being wriiten on the fly. An attempt to forge a whole new series would honestly try to form its own set a characters without chaining itself to the past, and a honest sequel would actually pick up from where the former series and its cast left, not after a gap of more than eight years after the fact. 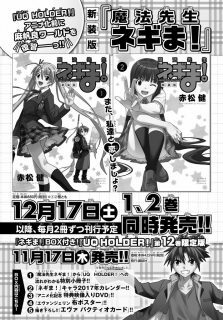 Again, UQ Holder is really neither, it’s just this strange beast that shuffles around randomly, trying to sell itself as Negima 2 now to gain more recognition and public appeal (and money, money, money! 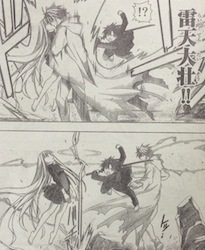 Just look at the whole frantic merchandise push) but without commiting itself to UQ Holder’s new cast or Negima’s. At this point it seems the only two characters who matter are Touta and Evangeline, and their relationship has become so creepy it’s very hard to like them as a couple no matter how much the plot pushes for it. 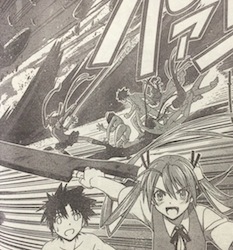 For new readers, the idea is to tease Negima. A lot of what the Japanese do is advertisement. Anime adaptations of manga or light novels are simply ads for for said manga/light novel series. So that’s what heavily influences my first though. OK, “getting them up to speed” isn’t correct terminology, now that I consider it. My entry should be corrected from Eva to Kuromaru – yes because of the hair clip – Kiboujin and Sugoi Karma are correct — Still, it makes me wonder more on why show Kuromaru that disguised way than his true self, and leaving out other girls too, including Eva. I think both parts of Kuroumaru showed up. However, the disguised version may be because Touta sees this Kuroumaru as a different girl. But why no Shinobu and Mizore? 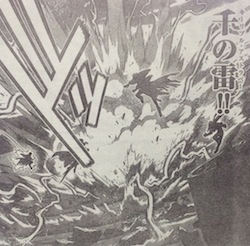 Unless based on the new spoiler images, Karin, Kirie, and Kuromaru were the ones brought into the phantasmagoria. The top half of that advertisement page shows that new “shinsouban” re-releases of the first two volumes are coming. Sailor Moon had a shinsouban re-release, and in addition to new covers, there was new bonus content, more color pages, and some small changes to art and dialog. 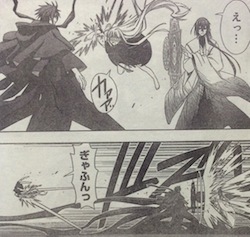 We can probably expect something similar with the Negima shinsouban. 1) I don’t know. Something about Negima and UQ. 3) Anime DVD. Maybe an intro one like they did with Negima? 5) Eva Pactio Card. Maybe new? I wonder if Kodansha Comics will release those as well. Given who’s the main focus is on two covers, I think we have an idea of the characters getting the cover focus in the updated versions of volumes 3 and 4 (not going any further here, as it’s possible the new versions may be a mix of volumes like other “shinsouban” releases, and I could so see volume 3 resolving the Evangeline arc and starting the Kyoto arc, volume 4 consisting entirely of the parts of the Kyoto arc that sets up Nodoka’s role as Negi’s second Ministra Magi, and volume 5 focuses on the rest of the Kyoto arc). I figure they may do what Kodansha Comics did for Negima in the U.S.
Yeah, I just had forgotten about the hair clip. what are the top images in the anime advertisement? The ones with Negi & Asuna and the one with Konoka, labeled 1&2? Interestingly, when Asuna is shown swinging with all her power, all of the ‘creepy’ naked girls/Kuromarus around Touta seem to have disappeared, but one of each still stays lying on the ground, seemingly unconscious instead of dispelled. My best guess is those are the real ones, brought along by Lifemaker just like Evangeline, which would imply (seeing how one of the Karin and Kuros in the fanservice hugging panel have ‘normal’ faces unlike the others) Lifemaker can use people, even immortals, as puppets. This would lend more credency to the theory she’s using the real Rakan, Albireo, Nodoka and Yue, but on the other hand only makes you question further why she ever loses at all if not because she takes convenient falls for the plot’s sake. I mean, it’s a bit tasteless how by now every conflict against her and her forces seems to be solved by a convenient Deus Ex Machina, and now we can add an Asuna pulled out of nowhere to the list. Aaaand of course raws would show up after the time for editing that post ran out. In support of my theory, the Kirie with the ‘normal’ face is shown briefly crying at Touta before they pull him into darkness, as if to stress she’s being forced to act against her will. Yeah, that’s possible. OR, she may not be being forced to act against her will. 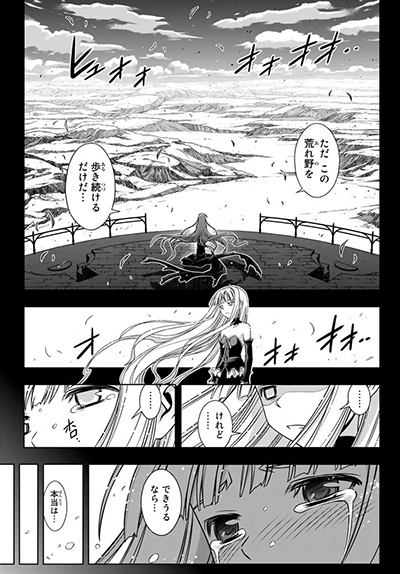 She might be in a scenario where her fears or whatever are there and she’s crying to plead with Touta to help her. Remember, MotB’s powers created the world of CE for folks to live in. There, it was a positive fantasy. Here, it would be a darker thing, bringing out Kirie’s fears. Just my own thoughts on this. Lifemaker can use people, even immortals, as puppets. This would lend more credency to the theory she’s using the real Rakan, Albireo, Nodoka and Yue, but on the other hand only makes you question further why she ever loses at all if not because she takes convenient falls for the plot’s sake. We saw her (disguised as Nagi) take control of Jack and Eva at the end of the Magic World arc, where Negi and Asuna defeated MotB after a fashion. They were simply frozen in place and could not move around much. As to MotB, she never really loses. The physical body she possesses at any one time may get defeated, but she never does. As to Asuna…yeah, that’s a mystery to me. It was a paralysis spell, not possession. Point is still semi-solid, though it doesn’t exactly explain much as to their situation. Al is the only one who should be logically alive, without any kind of intervention. It was a paralysis spell, not possession. True. But she nailed Jack and Eva, but not Negi. I’ve felt that this was part of MotB’s control over those whom she’s touched or who’ve been created by her power — the Illusionary Entities. Al is the only one who should be logically alive, without any kind of intervention. Possibly Jack too, since he’s also an Illusionary being. She was kinda busy choking Negi to death, so that wasn’t really needed. 😆 The way you phrased this, I suddenly had this scene from Full Metal Jacket in my noggin. I agree that the term Illusionary isn’t the best. I never cared for it much, but it was the term used by Akamatsu-sensei. That said, MotB has the ability to wipe them out rather easily whereas a human from Earth she can’t just wipe (rewrite). It may be nothing, but I’m curious to why I only find one Kuroumaru in the group? Plenty of Kuryus though. 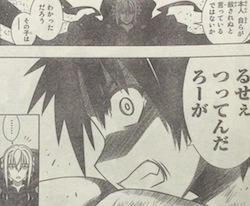 I also kind of feel he’s hiding behind Touta, but I may just be looking too deeply into it… and who is that fourth body? I can make out Karin, Kirie, and Kuroumaru easily enough. It kinda looks like Santa but where the heck would he have come from? I guess I’ll just have to wait. Yeah, until I see the chapter later on today, I can’t make any hard calls. “Maho Sensei Negima! 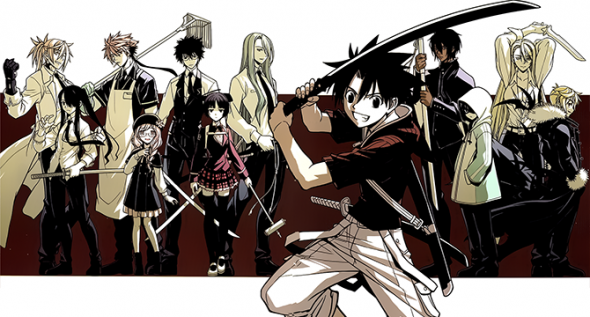 “And” UQ HOLDER! Connecting “,” Negima! “Super rare item with a limited edition! ! Ken Akamatsu × Mr. Yuki Matsuoka talk as “Maho Sensei Negima! “The DVD was recorded a special video, booklet” Memorial booklet leek memo! “, 32 th Pakutio card, Evangeline cloth poster,” Maho Sensei Negima! “Luxury with a five-point set of special desk calendar year 2017! ! Ditto. Working on my review. Hope to have it up in a few hours, as I’m able to get away from work and write. Yeah, I haven’t seen a new card yet. 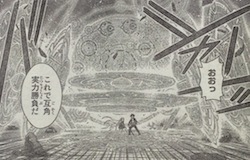 Just wanted to say, that fourth to last image, where someone is behind Touta and speaking to him, wasn’t in the english chapter I read. Haven’t seen it no matter where I look. Kind of looks like Asuna. Any info on that? It was page 37 of the Crunchyroll release. Its when Asuna hits Touta on the head, scolds him for giving us, especially as Negi’s grandson, then produces her artifact sword to bail him out.